Review by Karen Topham, American Theatre Critics Association member; photo by Lara Goetsch. In the Humana Festival hit Cardboard Piano, now having its Chicago premiere at Timeline Theatre, playwright Hansol Jung explores the difficult path from outright hatred to forgiveness, and whether the latter is even possible. Set in Uganda in 2000 and 2014, the play opens sweetly but ominously in a darkened church during a thunderstorm against the backdrop of war. Here two young girls, one a missionary’s daughter and the other a local girl, pledge their troth in an adorable wedding ceremony meant for no one but themselves with the occasional jump-scares of thunderclaps seeming merely an ironic background. But in the world of two young girls it is not possible to maintain perfect privacy. One worries about the reaction of her parents; the other, a war orphan, worries about her relatives. And then, suddenly, the hell of the outside world intrudes in the shape of a fifteen-year-old soldier trying to escape from the clutches of a warlord. He has committed atrocities he can’t forgive himself for, and for his running away has suffered violence: one ear has been cut off. Now he is afraid of losing his life along with the soul he is convinced he has already lost. It’s a stunning set-up. Telling much more of the plot of this taut drama very specifically would be to spoil surprises that are best left unspoiled, but it is easy to see that the specter of anti-gay hatred will raise its head as well as the horrors of war and the violent, extreme decisions that a young soldier like him find themselves making in moments of panic. But it is more than that: Jung’s narrative revolves around forgiveness as well: what are the limits, if any, of what can be forgiven? Can the boy, Pika (Freedom Martin), find forgiveness for the violent acts that weigh him down? Can he forgive himself for an action he committed in the name of hatred? How does love relate to the possibility of forgiveness? These are questions that Jung explores as the play goes on. The title of the play refers to a story that is told by one of the girls, Chris (Kearstyn Keller) to Pika in order to illustrate the passion of love and forgiveness. It is the tale of a loving act by her father, a man she ironically seems unable to forgive for other actions he takes. Nothing in this play is simple; nothing is black and white except the reality of death, which surfaces in both acts. The second act takes place fourteen years after the first when Chris returns to Uganda as a visitor to find that Pika is now the pastor of the church her father built. She is traveling with the ashes of her father, who wished to be buried at his church. Keller and Martin are both outstanding here. Martin enters Act One in a highly dramatic fashion, a fever pitch that remains through much of the act, calmed only momentarily by Chris’s story. Keller is called upon to enact the innocent love of a young, frightened girl in Act One and then to play that same girl over a decade later as she tries to come to grips with her own pain and lack of forgiveness. Confronted again by the same hatred that she found on her wedding night, her emotions overflow. Director Mechelle Moe shows us the passion of both love and hatred in various scenes in this play. In each act, there is a marriage being celebrated: one a wedding night and the other an anniversary. The same actress, Adia Alli, plays both wives and is able to bring the emotion of new love into both her teenage joy and the more mature love of a grown woman. Her characters brim over with their love, and Moe helps her to shape them as completely separate people in a similar emotional situation. The difference, though, is that the young girl can actually believe that all of her problems can be solved by running away and the older woman knows that her job is to remain where she is as a means of support to her troubled husband. That husband, the grown Piku, is played by Kai A. Ealy, who plays a menacing soldier in Act One. Like Martin, Ealy is intense as Piku (who now goes by the name Paul). He is also utterly immersed in his faith, which in Uganda means revulsion toward homosexuals. (Martin appears in this act as a young gay parishioner.) Still struggling to forgive himself for past actions, Paul is desperately trying to lead a church that teaches forgiveness but doesn’t always practice it. Ealy is a powerful figure in both acts, and Moe has clearly worked with him as well on physical issues so that his two characters, both of which we see in moments of anger, are not at all the same. 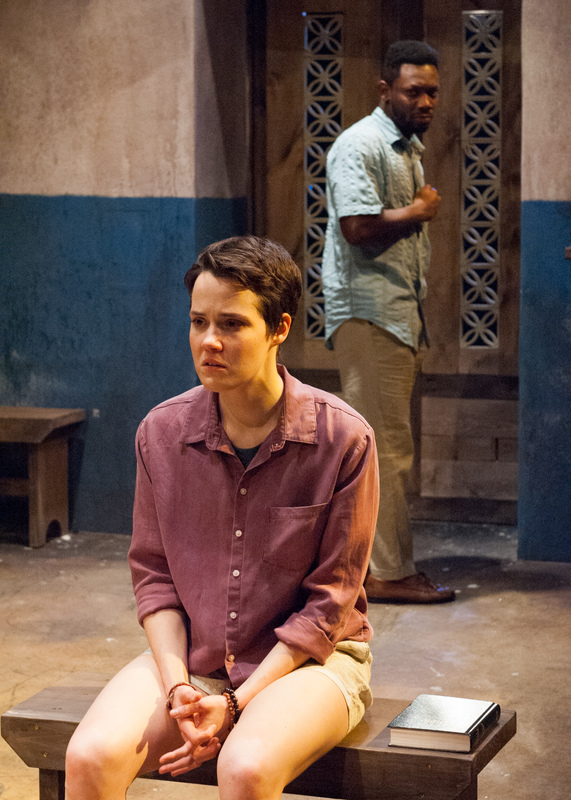 Jung’s play gives us a chance to see both this emotion and love in two different contextualizations, and Moe’s direction, which maintains perfect pacing throughout the play and uses every bit of the space, is perfect. She has assembled a strong group of designers as well. Jeffrey D. Kmiec’s set is beautiful whether in its dark, “under construction” phase in Act One or as a fully realized church in Act Two. Elle Erickson’s costumes evoke character perfectly. 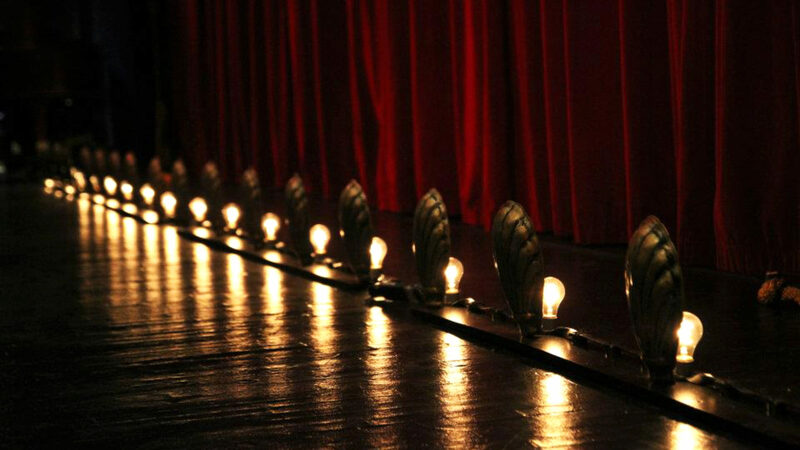 Lighting designer Brandon Wardell has the tricky task of lighting a darkened stage for a whole act and pulls it off beautifully. And the thunderstorm is a part of the excellent sound design by David Kelepha Samba. There is also some unusually intense fight choreography by Jon Beal. And Jung’s use of dance and music in various parts of the show (choreography by Fatima Sowe) helps to ground her play in the joy of faith, a sharp contrast to the hate-infused beliefs that Piku promulgates. As it did with Boy last year, Timeline Theatre has begun 2019 with a show that is powerful and provocative and memorable. I would not be surprised to find, next December, that it remains one of the brightest spots of Chicago theatre for the year. Cardboard Piano is now playing at Timeline Theatre, 615 W. Wellington, Chicago until Mar 17. Check the website for specific dates, times, and tickets. Find more information about current plays in our front page recs and at theatreinchicago.com.